1. Follow your meal routine. Eat every three to five hours. Avoid skipping meals. Skipping meals so you can indulge later typically backfires. When you skip a meal your blood sugar level may drop. This can lead to intense hunger. You may end up eating more than you usual and your desire to make healthy decisions will go out the window. Tip: eat a healthy snack or meal before you go out so you don’t overindulge at a party. Try to combine some protein with a complex carbohydrate and you may feel full longer. Think a small handful of nuts or a KIND bar and a fresh fruit. Or a peanut butter and banana sandwich on whole grain bread. 2. Balance your plate. For the party meal, think MyPlate guidelines: ½ of the plate should be non-starchy vegetables such as broccoli, asparagus, Brussels sprouts or salad, ¼ of the plate can be from protein sources like grilled salmon, sautéed tofu, beans or chicken breast and ¼ starch consisting of pasta, rice or sweet potatoes. Add in a small serving of dessert if you so desire or very small portions of several desserts. Think volume for the vegetables and portion control of the more decadent sides and desserts. 3. Don’t drink your calories. We all love those holiday punches, ciders, cocktails and hot comforting drinks but know what is in your glass before indulging. Always start the party off with water or a glass of seltzer. If you want to get or remain svelte, stick with the two aforementioned beverages! If you must imbibe, one to two glasses of wine or 2 oz. of vodka, gin or rum with seltzer or a splash of juice should be your limit. Just an FYI: Egg Nog is one of the richest holiday drinks, containing 350 calories, 19 grams of fat and 22 grams of sugar per 1 cup (8 ounce) serving! CalorieKing (www.calorieking.com) is a great website (and FREE app) for nutrition information on drinks and food. 4. Fill your kitchen with healthy whole foods so you eat well at home. Purchase fresh fruit and vegetables, beans, hummus, tofu, fish, chicken, lean meat, nuts and nut butters and whole grains, such as quinoa, whole wheat pasta and couscous, cereals and popcorn. 5. Maintain your exercise routine. Exercise helps prevent weight gain and relieves holiday stress. Walking at a brisk pace, just 20 minutes daily, is quite beneficial. 6. Aim to maintain weight, not lose it. Enjoy the holiday season and the time you spend with friends and family. You will get more enjoyment out of laughing with those you are closest to than indulging in unhealthy holiday foods. Don’t let the buffet table become your focus! Lisa Stollman, MA, RDN, CDE, CDN was recently honored as the 2015 The Outstanding Dietitian Of The Year by The New York Academy of Nutrition and Dietetics. She is a speaker, blogger, entrepreneur and innovator who is passionate about spreading the message of healthy plant-based eating and optimal health. To help restaurants improve upon menu choices and food preparation, Lisa recently founded Eat Well Restaurant Nutrition where she collaborates with chefs. She is also the author of the e-book The Trim Traveler: How to Eat Healthy and Stay Fit While Traveling Abroad (Nirvana Press 2014) and the widely-acclaimed book The Teen Eating Manifesto: The Ten Essential Steps to Losing Weight, Looking Great and Getting Healthy (Nirvana Press 2012). In her private practice, with offices in Huntington, NY and the Upper East Side of Manhattan, Lisa specializes in weight managment and diabetes for teens and adults. Contact Lisa here or visit here for more info. The month of December is a time to celebrate your accomplishments of 2016, welcome the winter weather, and observe the holidays festivities, all while enjoying the sparking lights around town. Unfortunately for many, it is also a time where healthy eating is thrown to the wind and a balanced diet is replaced with an overloaded plate of decadent meals and desserts. While “treating yourself” every now and then is perfectly fine, there is likely some room for improvement in, at least most people’s, December diets. 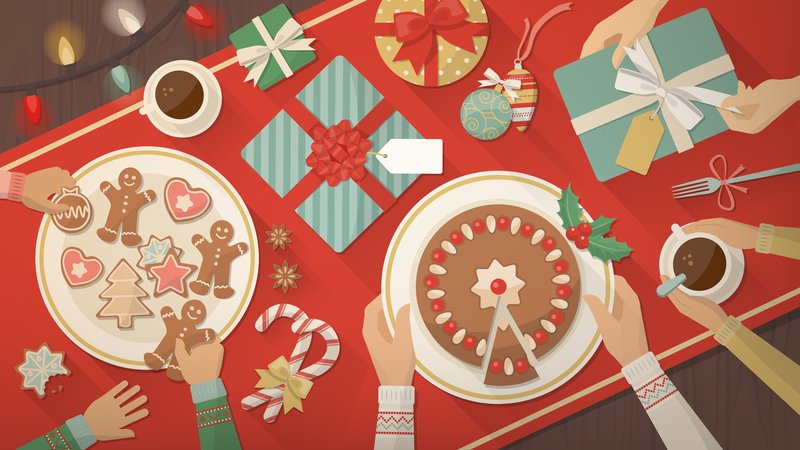 Below are some tips and tricks to make this holiday party season your healthiest! When you arrive, take a lap or two around the spread of food before picking up a plate and loading it up. When you are ready, fill 1/2 of your plate with things you really want (and don’t usually get to eat), and the other half with salad and/or vegetables. To avoid going crazy on one extreme, whether gorging on treats or trying to 100% omit them all night, allow yourself to enjoy a couple small desserts. Let this be your indulgence, and savor it slowly to enjoy it and make it last longer. By practicing this mindfulness, you can enjoy the treats even more and save plenty of calories. Fill up on fiber-rich foods first, so you have less room later for the gravy-covered meats and dense desserts. Look for fruits and vegetables, or bring a platter of either to guarantee you have these options. Plus, the fiber in fruits and vegetables will also help fill you up with the “good stuff.” Sorry, mystery holiday loaf, there’s no room for you this year! Go easy on the alcoholic beverages. Not only do they add on the calories, they can lower your blood sugar (thus making you hungry) and cause you to overindulge on more food. So try to limit the drinks to one or two. Have a glass of wine, spritzer or a martini. Steer clear of the sugary drinks. Stay standing while mingling at the party – by avoiding the couch, you will be burning more calories while strengthening your muscles. It’s also harder to continuously nibble on food while standing and moving around. If you have health- or weight-related New Years resolutions brewing in your mind, write them down now and practice them before the holiday season is in full swing. You’ll avoid packing on the holiday pounds, plus you’ll feel more motivated come 2016, knowing this was your healthiest holiday season yet! Be MINDFUL. Remember that you are in complete control of everything you eat and drink. Remind yourself of that as much as you need. Lisa Stollman, MA, RDN, CDE, CDN was recently honored as the 2015 The Outstanding Dietitian Of The Year by The New York Academy of Nutrition and Dietetics. She is a speaker, blogger, entrepreneur and innovator who is passionate about spreading the message of healthy plant-based eating and optimal health. To help restaurants improve upon menu choices and food preparation, Lisa recently founded Eat Well Restaurant Nutrition where she collaborates with chefs. She is also the author of the e-book The Trim Traveler: How to Eat Healthy and Stay Fit While Traveling Abroad (Nirvana Press 2014) and the widely-acclaimed The Teen Eating Manifesto: The Ten Essential Steps to Losing Weight, Looking Great and Getting Healthy (Nirvana Press 2012). In her private practice, with offices in Huntington, NY and the Upper East Side of Manhattan, Lisa specializes in weight managment and diabetes for teens and adults. Contact Lisa at eatwellrd@yahoo.com or visit here. Special thanks to Samantha Marks, Dietetic intern, for her contributions to this post. 1. Follow your meal routine. Eat every three to five hours. Avoid skipping meals. Skipping meals so you can indulge later typically backfires. You may end up eating more than you usually do and your desire to make healthy decisions will go out the window. Tip: eat a healthy snack or meal before you go out so you don’t overindulge at the party. Try to combine some protein with a complex carbohydrate and you may feel full longer. Think a small handful of nuts or a KIND bar and a fresh fruit. Or a peanut butter and banana sandwich on whole grain bread. 2. Balance your plate. For the party meal, think MyPlate guidelines: ½ of the plate should be non-starchy vegetables such as broccoli, asparagus, Brussels sprouts or salad, ¼ of the plate can be from protein sources like grilled salmon, sautéed tofu, beans or chicken breast and ¼ starch consisting of pasta, rice or sweet potatoes. Add in small serving of dessert or very small portions of several desserts. Think volume for the vegetables and portion control of the more decadent sides and desserts. 3. Don’t drink your calories. We all love those holiday punches, ciders, cocktails and hot comforting drinks but know what is in your glass before indulging. Always start the party off with water or a glass of seltzer. If you want to get or remain svelte, stick with the two aforementioned beverages! If you must imbibe, one to two glasses of wine or 2 oz. of vodka , gin or rum with seltzer or a splash of juice should be your limit. Just an FYI: Egg Nog is one of the richest holiday drinks, containing 350 calories, 19 grams of fat and 22 grams of sugar per 1 cup (8 ounce) serving! CalorieKing (www.calorieking.com) is great website (and FREE app) for nutrition information on drinks and food. 4. Buy healthy whole foods so you eat well at home. Purchase fresh fruit and vegetables, beans, hummus, tofu, fish, chicken, lean meat, nuts and nut butters and whole grains, such as quinoa, whole wheat pasta and couscous, cereals and popcorn. Lisa Stollman, MA, RDN, CDE, CDN was recently honored as the 2015 The Outstanding Dietitian Of The Year by The New York Academy of Nutrition and Dietetics. She is a speaker, blogger, entrepreneur and innovator who is passionate about spreading the message of healthy plant-based eating and optimal health. To help restaurants improve upon menu choices and food preparation, Lisa recently founded Eat Well Restaurant Nutrition where she collaborates with chefs. She is also the author of the e-book The Trim Traveler: How to Eat Healthy and Stay Fit While Traveling Abroad (Nirvana Press 2014) and the widely-acclaimed book The Teen Eating Manifesto: The Ten Essential Steps to Losing Weight, Looking Great and Getting Healthy (Nirvana Press 2012). In her private practice, with offices in Huntington, NY and the Upper East Side of Manhattan, Lisa specializes in weight managment and diabetes for teens and adults. Contact Lisa at eatwellrd@yahoo.com or visit here.